StorageMart San Antonio is more than just self storage, we're "The Friendly Storage People". Our well-trained staff will work with you to ensure you find the storage solution best suited to meet your needs. We're also constantly looking for ways to enhance the services we provide, guaranteeing you the greatest value for your storage dollar. 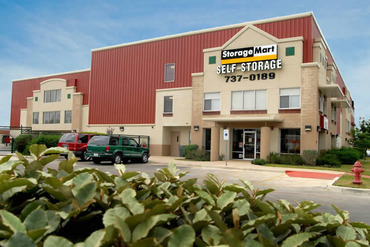 This San Antonio StorageMart is ready to answer all your questions and provide the best service. "Jessica has always been so friendly and helpful. I've never had any issue here. Fair prices also"
"Convenient, clean place, love all the street names in the Hallways. Friendly knowledgeable staff. Always receive excellent service. We bought some shelves so we could maximize a 5' x 5' space. The only negative is that there's a gap between the ceiling and the storage room. I suppose if someone really wanted to, they could get a ladder and climb into your unit. Although since there are cameras everywhere, you couldn't get away with much. I understand it's for fire safety issues, but if the sprinklers go off accidentally, things are going to get wet. So don't place your music instruments or important papers on top or near the door." "My experience was great! Jessica was very friendly and knowledgeable. The whole sign up process was quick. She showed me to my unit and went over all the details. I recommend this location for its cleanliness and friendly staff." "What a WONDERFUL place to store your stuff!! Jessica, the manager, is such a gem! She is so helpful and upbeat! She truly provides INCREDIBLE customer service! I had to store all of my belongings as I travelled around the country for several months and she was so helpful and friendly! She found me an incredible deal and was always easy to reach! I could not imagine a better experience! Thank you Jessica and StorgeMart!" "Jessica and her team are GREAT!!!! The staff are always helpful and Friendly. The place is clean and I have never had any problems."